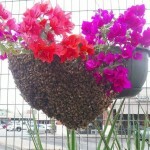 Morning coffee at The Oasis Cafe after an emergency bee swarm response in their parking lot. These bees have occupied this space for about 10 days. Even though it was a rainy morning, these ladies were gentle (no stings) and have a LOT of brood and nectar. Looking forward to seeing how they fare at the farm. Doing our part to keep our pollinators safe – at The Blind Butcher.